I always loved the idea of Halloween. Homemade costumes were a must. At first, our mother made our costumes, but the gauntlet was passed early on, and we sewed our own. I remember making a fairy costume for myself and the wings kept falling off. Well, you would have thought the world ended. I planted myself in the corner of the classroom, bawling my eyes out, as my classmates, eyebrows raised, cautiously stepped around my desk. It was almost the same as the times I tried to make a kite out of two-by-fours and garbage bags and was devastated when I couldn’t get them to fly. Yeah, math and engineering were a field I never would go into. 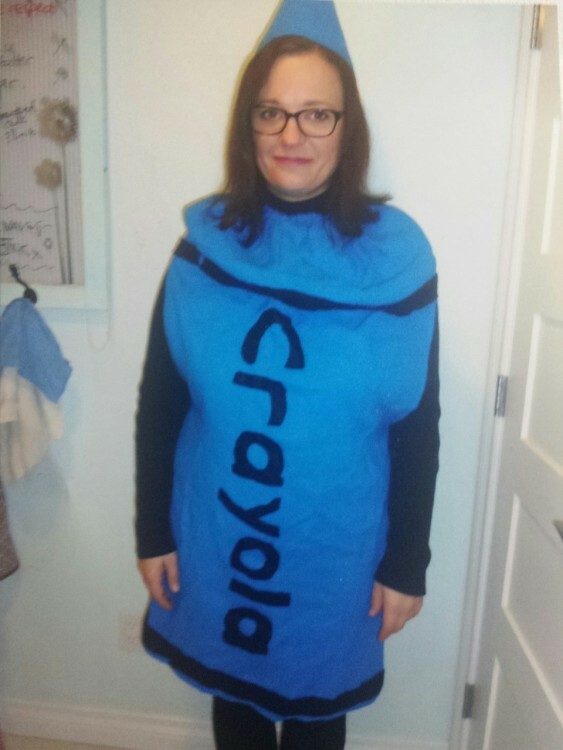 The woman pictured above is me, two years ago, dressed as a crayon. I think that sentence was unnecessary, but I’m putting it in anyway. Now here’s where the “power performance” comes in. I had to conserve energy because I desperately wanted to be original and funny while trick-or-treating with my niece and nephew. I wanted it to be memorable for them. So I rummaged through my storage closet and found this outfit that I had made with my own two hands when I was in grade nine. This is a relatively calm command derived from the “Star Trek” series. For me, it means something very different. When something of utmost importance must be done, I simply break through that mental barrier like a big, strong football player. I know nothing about football but I think it might be the linebacker? I don’t say, “Well, I might get hurt or be unconscious or get a headache or have to go to the hospital or urinate on myself.” No. I just do it. Because somebody else needs me and I said I’d be there for them and I love them. So I push and break glass and burn and pillage and plunder in my mind’s eye. I smiled, I made people laugh, protected my niece from a big scary dog, did not urinate on myself, and everybody remembered that day forever. Including myself. I look back at that picture and it makes me smile. When I got home, I needed to remove the costume and replace it with the pajamas I had been wearing all day prior to donning the crayon outfit. Makeup removal was out of the question. Enough nights and the pillowcase would take care of that for me. In my mind’s eye, I was no longer pushing and breaking things and pillaging and plundering. It was over. So I slipped into something even more comfortable for the next two days: a deep, deep sleep that was almost like a coma.